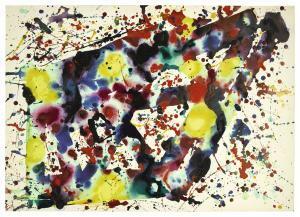 Find artworks, auction results, sale prices and pictures of Sam Francis at auctions worldwide. Sam Francis American Abstract Oil on Canvas Oil on canvas, stretched and framed. Featuring an abstract expressionist composition. 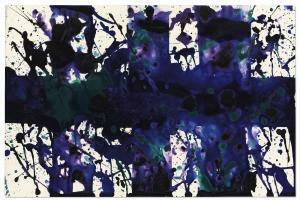 Signed Sam Francis on the lower right corner. 51 x 40 cm (20.1 x 15.7 inches), frame: 63 x 52.5 cm (24.8 x 20.7 inches). 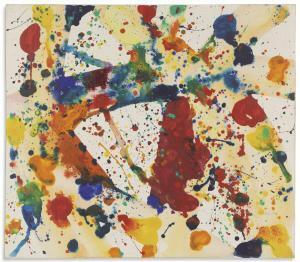 PROVENANCE: Southern Ontario estate Sam Francis (1923-1994) was an American artist known for his exuberantly colorful, large-scale abstract paintings. His practice incorporated elements from Abstract Expressionism, Color Field painting, Impressionism, and Eastern philosophy to create a unique style of painterly abstraction. Influenced by Jackson Pollock and Clyfford Still, he is more closely associated to the work of Helen Frankenthaler, as he was more interested in the formal arrangement of the picture plane than the expressivity of the individual artist. 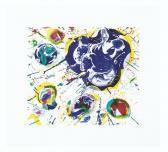 \“Painting is about the beauty of space and the power of containment,\” he once reflected. Born on June 25, 1923 in San Mateo, CA, he briefly served in the US Air Force during World War II but was injured during a test flight. Returning to California, he received his BA and MA from UC Berkeley in botany and psychology before beginning to pursue a career in art. The artist traveled widely during his career, and he was closely aligned with the Art Informel movement while living abroad in Paris during the 1950s. Francis died on November 4, 1994 in Santa Monica, CA at the age of 71. He was a founding trustee of Los Angeles\’s Museum of Contemporary Art, and his paintings can be found in the collections of the Metropolitan Museum of Art, the Kunstmuseum Basel, and the Centre Georges Pompidou in Paris, among others. 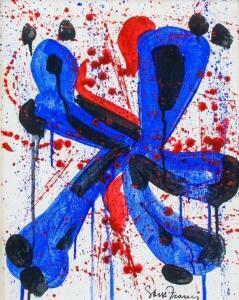 SAM FRANCIS (1923-1994) Untitled signed and dated 'Sam Francis 1979' (on the reverse) acrylic on paper 11¾ x 17¾in. (29.9 x 45cm.) Executed in 1979 Please note this lot is the property of a private individual. Provenance Private Collection. Anon. sale, Kunstauktion Pro Infirmis Zurich, 10 September 1981. Acquired at the above sale by the present owner. Sam Francis (1923-1994) Yellow Beam signed, dated and inscribed 'Sam Francis 1973 Bern' (on the reverse) acrylic and oil on canvas 27 x 31in. (68.6 x 78.7cm.) Painted in 1973 Provenance Gimpel Fils Gallery, London. Galerie International, Milan. Private Collection, Zurich. André Simoens Gallery, Knokke. Private Collection. Samuel Vanhoegaerden Gallery, Knokke. Acquired from the above by the present owner.